If you’re looking for colleges that offer good Athletic Training Programs across the country, you’ve come to the right place! The first step to kicking off your career as a well-paid athletic Trainer is getting a degree. After your studies, you can go on to get certified and become a licensed trainer. Athletic training is unique in the sense that it is one college degree that allows you to get a lot of hands-on experience. The reason is that there is almost always not enough athletic trainers at most schools. There are always athletes in need of treatment, and that gives students a chance to catch up. According to the National Athletic Trainers’ Association (NATA), to become certified, you must hold a Bachelor’s or Master’s degree in an approved course. Alternatively, you can complete an approved sports training program at one of the accredited colleges across the country. Also, for you to be eligible to sit for the exam, you need to have graduated from a Commission on Accreditation of Athletic Training Education (CAATE) approved institution. There are about 360 CAATE schools around the country. After you pass the BOC exam, you earn a certification that allows you to practice as a certified sports trainer. After Athletic Training programs have been completed, individuals can then take a professional exam set by the Board of Certification (BOC). If you pass the exam, you can work as a Certified Sports Trainer. A BOC certification is the only recognized certification program for trainers in the U.S. Many good colleges offer these programs in the U.S. We’ve made extensive research of the Top 10 colleges for you to kick off your career as a Sports trainer! Athletic Training Programs – Top Colleges In The U.S. The University of Miami offers a single training/trainer degree program in sports. At the University of Miami in Miami, Florida, students in the Department of Kinesiology and Sports Sciences will not only learn the medical aspects of the business, but they will also learn the ethical reasoning and interpersonal skills that will make them an asset to any medical practice. Located in Ashland, Ohio, Ashland University is a recognized sports training school. This college offers a Bachelor of Science in athletic training. They also offer a graduate program for those who want to further their education to Master’s level. Located in New York, the university offers one sports training program and a minor in exercise science. Scholars can also take part in local sports competitions by playing for any of the school’s 21 varsity teams. After finishing your training program, you will be eligible to sit for the National Athletic Trainers’ Association BOC exam. Located in Anderson, Indiana, Anderson Uni. was the first private college in Indiana to become accredited by CAATE. Students get access to remedial and rehabilitation equipment at the university’s Sports Medicine Center. The University of Texas offers a B.S. in athletic training under the Department of Kinesiology and Health Education. Ithaca offers an athletic training program through the Department of Exercise and Sports Science. As an underclassman, you apply for admission directly into the actual athletic training program. The University of Michigan at Ann Arbor is an accredited CAATE institution offering an Athletic Training Educational Program to earn a B.S. in kinesiology, physiology, anatomy, pharmacology, and nutrition. The University of Florida offers an athletic training program through the College of Health and Human Performance. Scholars must take multiple hours of administered training and pass various tests for first aid and emergency treatment. At the University of Illinois, students experience rigorous exercises to learn how to prevent injuries and treat athletes. After they have completed the program, they will sit for a professional certification exam. Boston University in Massachusetts awards degrees to students to become professionals in athletics, education, and sports clinics across the country. DePauw Uni. in Indiana offers a B.S in Sports medicine or Sports and Exercise Science via the Kinesiology department. 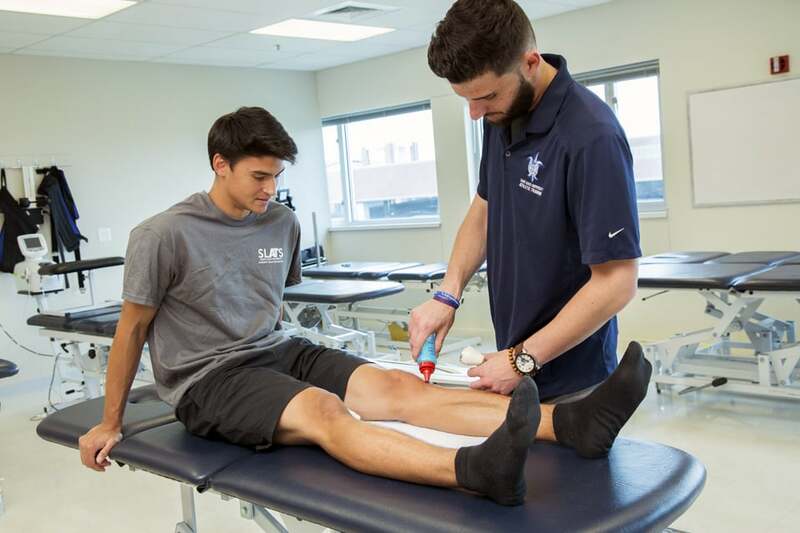 Brigham Young University in Provo, Utah offers an Athletic training program to prepare students for their careers in sports healthcare administration. George Washington University in Washington, DC offers three separate degrees in the field of Sports health – Athletic Training, Exercise Science, and Public Health. A renowned University of North Carolina system, The University of North Carolina Department of Exercise and Sports Science offers B.As in Athletic training, Fitness professionalism, Exercise science, and sports administration. Kho Health helps to connect injured athletes with top healthcare providers in their locality. Gain instant access to a slew of top Sports Healthcare Experts. If you would like to connect with other sports medicine providers like chiropractors, physical therapists, and naturopathic doctors, Kho Health is a great place to start. You save time and money when you speak with the right professionals. You can also use it as a networking tool to learn from those that work at the best athletic training programs. There are many different options you can go with when looking for a provider. You could get a chiropractor, massage therapist, physical therapist or many other options. The key is finding someone you trust and that you are excited to work with. Knowing they came from the best athletic training program does not matter so much. If you have no idea what you need, but you know you need something, Kho Health is an injury guide, and you will get helped through the process. We make it easier for you to find the information and the person you are looking for. We do not compare the best athletic training programs yet.